I have decided to put a bit more effort into my melon photos, well all my produce photos really. I am a bit ashamed of mine after reading Amy Goldmans books so I have decided that I might not be able to do as well, but they will be interesting nontheless. Here are a couple of melons I picked yesterday - Noir de carmes from France and Krynychanka from Russia (The two at the back). I am going to work on finding a better background for my photos though. This is Noir de carmes sliced open. 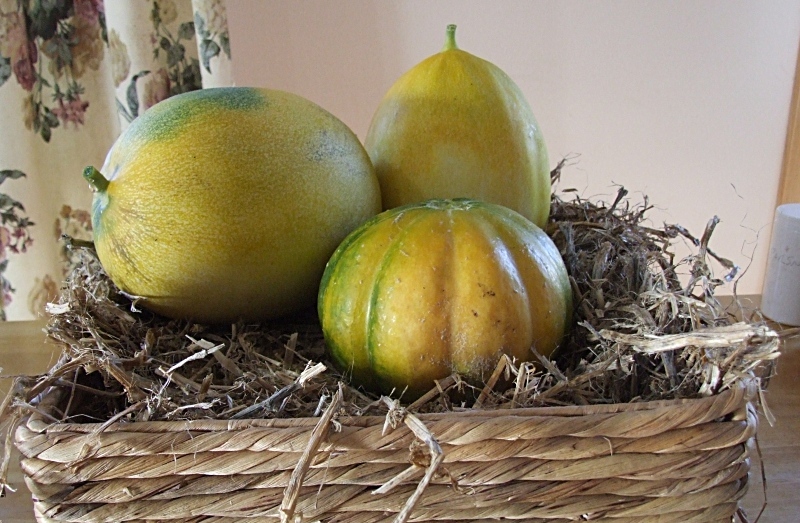 This melon is a very old variety that is productive but has its problems. It is probably not for the new melon grower. 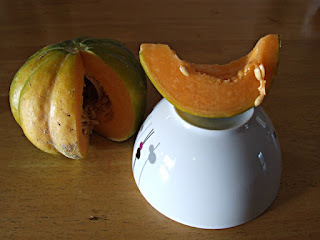 Its fruit get badly sunburnt and ruined at the slightest hint of a warm, sunny day, and the fruit ripen in hours and get over-ripe so quickly that you have to be aware of any minute changes and pick them at the exact right time. - But is is very sweet and juicy, yum. Many of the melons are about to ripen in the next week and my fridge is already full of cut melons from my tasting, assessing and saving seeds.